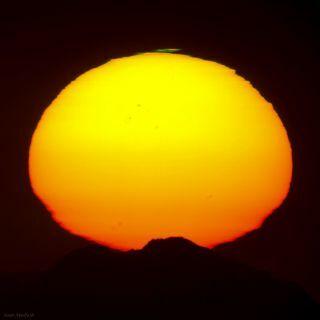 Skywatcher Amir H. Abolfath captured this photo of the setting sun over the Zagros Mountains of Iran. The green flash above the sun lasts for mere seconds making it often difficult to observe. Atop a frigid mountain peak in Iran, skywatcher Amir Hossein Abolfath captured a phenomenal sun setting with a brilliant flash of green. This photo of the sun setting over the Zagros Mountains of Iran shows a view of our largest star right at the horizon. The momentary green flash above the sun is typically a difficult phenomenon to observe because it last for mere seconds. The green light is usually observed above the rising or setting sun. The phenomenon is caused by the atmospheric refraction of light. The effect works like a prism because the Earth’s atmosphere breaks up white sunlight into colors. Higher frequency colors, such as green and blue, are bent at larger angles than lower frequency colors. When the sun starts to slip below the horizon, the colors of the spectrum disappear one at a time, going in order of those with the longest wavelengths to those with the shortest. Air and water vapor absorb the red, yellow and orange colors, but green is typically the last ray of light that can be seen. Given the right atmospheric conditions and a clear sky, a green flash can be observed when the sun is close to a distant horizon. Avid skywatchers must carefully time the setting or rising sun to observe the phenomenon. Or they might just get lucky.